In an era where notched abominations are increasingly being passed off as phones, it’s refreshing to see a device that doesn’t have one. One would expect the likes of Samsung to come up with the idea of a sliding camera mechanism, but it turns out that Oppo and Vivo did it first. The third device that is confirmed to sport a similar mechanism is none other than Xiaomi’s Mi Mix 3. We’ve seen a lot of leaks for the Mi Mix 3 so far and these have confirmed that the smartphone will feature a sliding front camera mechanism. Xiaomi’s breaking away with tradition on the Mi Mix 3, as the move, will take away the lineup’s iconic feature that lent it a distinct look in a time when bezels were common. But Xiaomi’s moving fast, looking to cater to users who want the maximum amount of screen-to-body surface area. As the proverbial final nail in the coffin, we’ve got another leak for the Xiaomi Mi Mix 3 today. Take a look below for more details. If there’s one thing that recent leaks for the Xiaomi Mi Mix 3 confirm, it’s that the device appears to be in the final stages of development. Earlier today, a leaked image of the smartphone clearly displayed the fact that the device is undergoing network testing. Speaking of which, this variant of the Mi Mix 3 had a rather interesting icon at its top right. 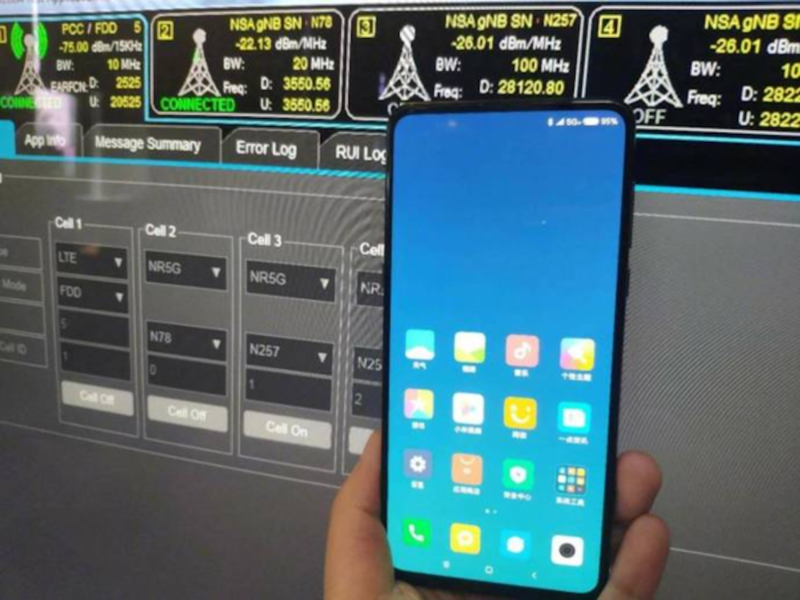 The smartphone seemed to be connected to a 5G network, which is surprising particularly due to its thin form factor. If Xiaomi launches the device this year, which it should, then the Mi Mix 3 will feature Qualcomm’s Snapdragon 845. The SoC does not have 5G support and to gain this feature, a device needs to use the Snapdragon 855; which not only requires heftier batteries but also an add-on accessory. Given that Xiaomi’s President LinBin has shared an image of the upcoming Mi Mix 3 on his Weibo, it’s unlikely for the Mi Mix 3 to use any internal components for the feature. The device in this image had a thin form factor removing the possibility of heftier batteries. But right now, we’ve got what appears as the first authentic live video leak of the Xiaomi Mi Mix 3. The first thing that pops out when you take a look at the video above is the fact that the Mi Mix 3 has the thinnest bezels of the majority of smartphones available right now. It then confirms the device’s sliding camera sensor, but with a catch. If you’re a regular, you’ll know that another Chinese company Oppo already launched a smartphone with a sliding camera setup, which is motorized. Xiaomi, on the other hand, is sticking to the good old manual mechanism, in a move that will definitely bring down the Mi Mix 3’s ‘premium’ image down in front of a lot of users. There might also be technical considerations at hand, with inadequate motors, increased thickness, and overall reliability being a few of them. Which brings us to the final two points. Will the Mi Mix 3 stand the test of elements with the sliding mechanism and will Xiaomi place the device’s rear cameras in the sliding mechanism like the Find X? If it chooses to do the latter, then the Mix 3’s aesthetics will completely depart from the lineup’s customary approach, making more sense for Xiaomi to name the smartphone something else; something that signifies a reboot.